Data gathered by NASA’s Mars Global Surveyor spacecraft suggest that the martian climate may have changed significantly in the past, and may be changing quickly even now. 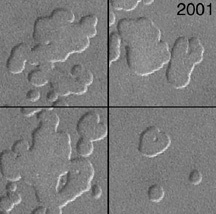 According to two papers published in the Dec. 7, 2001, issue of Science, these changes may happen over a much shorter time scale than scientists previously thought. Compare each image on the left its their counterparts on the right. Small hills vanished and pit walls expanded between 1999 and 2001.The south polar pits, formed in frozen carbon dioxide,expand as the carbon dioxide sublimates away a little more each martian year. Sunlight illuminates each scene from the upper left. Courtesy of NASA/JPL/Malin Space Science Systems. The pits are enlarging so quickly that the entire upper layer of the ice cap is likely to be sublimated to gas within a martian decade or two. Because carbon dioxide is a greenhouse gas, the pressure and temperature of the martian atmosphere may change dramatically over periods as short as a few hundred years. If enough carbon dioxide is present in Mars’ south polar ice cap, it could potentially raise surface pressures enough to result in temperatures sufficiently warm for surface water to exist. Malin and Kenneth Edgett published a paper in the June 30, 2000, issue of Science describing evidence of gullies on the martian surface that may have been created by recent water flows. Observations made with the Mars Orbiter Laser Altimeter (MOLA) were described in a separate study in the same issue of Science. A paper by David Smith, Maria Zuber and Gregory Neumann presented detailed measurements of the planet’s topography and gravitational field suggesting significant changes in the martian atmosphere within the space of a single martian year. Because it is also tilted on its rotational axis, Mars has seasons like Earth. As its surface gradually becomes darker during the martian autumn and winter, carbon dioxide gas “freezes out” of the atmosphere. Dense dry-ice snow accumulates at both poles, demarcated by a “frost line” that reaches the planet’s mid-latitudes by winter. In spring and summer the process reverses. Smith’s paper described how up to 2 meters of dry-ice snow accumulates in winter, mostly at latitudes above 80 degrees. The authors also reported a tiny change in the martian gravity field reflecting a global-scale mass redistribution. So much carbon dioxide is exchanged between Mars’s atmosphere and surface — as much as a third of the planet’s carbon dioxide over a full martian year — that the planet, which like Earth is slightly flattened, actually becomes rounder in winter. This story first appeared as a Web Extra on Jan. 11, 2002.